Michelle Southern, founder of Street Paws, said much of their work is built on trust between owners and volunteers. 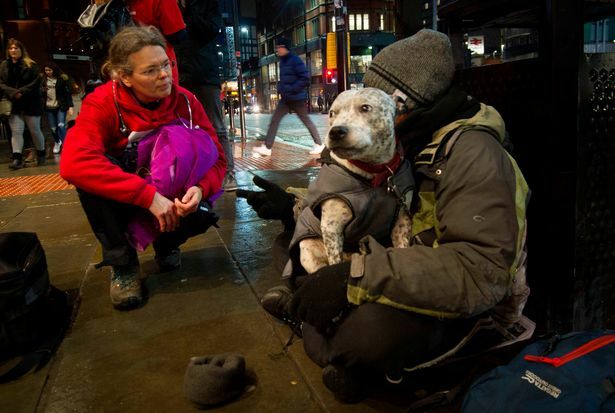 At first many homeless people are wary for fear their dog is taken away from them. “A lot of people don’t want help because they’re terrified of being separated,” says Michelle. “It can take a little bit of time for people to trust us and let us help. A common problem at the moment is when a roughsleeper falls ill and ends up in hospital. Quite often their dogs are picked up as strays and end up with the warden. Street Paws have now teamed up with the PDSA to provide a monthly mobile vet clinic in Manchester city centre. 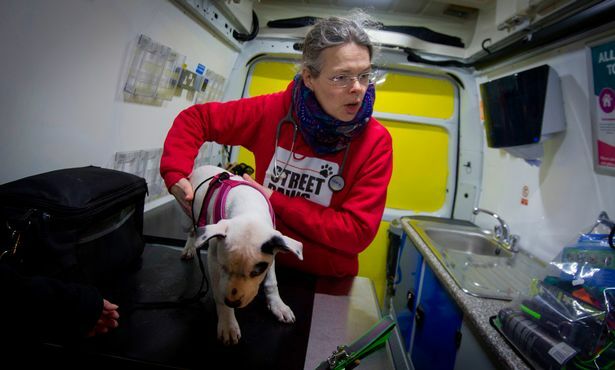 It means the Street Paws volunteers are able to carry out veterinary care in the PDSA’s treatment bus. General health checks, vaccinations, flea and worming treatments can all be provided in the mini-mobile vet clinic. Food, treats and even little coats to keep dogs warm are also on offer for those in need. The first owner and dog the team come across in Piccadilly Gardens is a 20-week old Staffie cross called Delilah. The bouncy pup and her owner, who asked not to be named, are well known faces to the Street Paws team. It turns out Delilah had been missing for two weeks and had turned up at Manchester and Cheshire Dogs Home. The team are pleased to hear she’s been reunited with her owner. The 32-year-old woman waits while Delilah has her second round of vaccinations as well as a general check with the vet. “I couldn’t live without a dog,” her 49-year-old owner says. “She’s my best friend and she protects me. She snuggles up to me in my sleeping bag at night. I couldn’t live on the streets without her. “We’re training her at the minute like you would any puppy.